Ben Swain is a man of many personal and professional successes. Ben was also born with congenital limb differences affecting his hands and one foot. In this article Ben shares with us his story of living life with limb differences highlighting that, while this has brought some challenges, it has not marred his ability to achieve career and sporting successes. Ben is 36, resides in Newcastle in New South Wales and combines a busy workload as both a lawyer and an award-winning para-cyclist. Ben was also born with a congenital limb difference. “I was born with Split Hand and Foot Malformation, a genetic disorder that is characterised by the complete or partial absence of fingers or toes. I have a thumb and forefinger on my left hand and my right arm is malformed from the elbow. I was also born with a malformed left foot”, explained Ben. Ben underwent corrective surgery during his childhood aimed at mitigating the impacts of his limb differences and enhancing his physical abilities. “When I was about two years old I had an operation to remove a toe and to close the cleft on my left foot so I could wear a shoe. I also had some tendons released in my left hand,” said Ben. Presently, Ben and his family are trying to identify the gene that has caused his limb differences with the help of researchers at the Greenwood Genetic Centre in the United States of America. As a child Ben didn’t wear a prosthesis, was encouraged to try everything and learn to make personal adaptations that would facilitate social and physical participation. As Ben expressed, “I grew up on a farm with my brother. Our parents did the best thing for me by treating us both the same way. I did everything my brother did and was brought up to believe that anything is possible if you want to do it”. Ben highlighted that “it wasn’t always easy when I was growing up” but he utilised resources and adopted new approaches that accommodated his limb differences. “When I was young I did use some assistive devices, including electronic scissors which all my school friends wanted to use,” recounted Ben. “But overall I achieved most things with just a little bit of determination and sometimes developing my own way of doing things, like how to tie shoe laces or serve one-handed when playing tennis”, shared Ben. In reflecting on both his childhood and adulthood, the response of others to Ben’s limb difference has generally been positive. Although Ben has also experienced the occasional undesirable response, he has a philosophical and pragmatic approach in these situations. “Growing up I have learned that people always remember you when you have a limb difference. The majority of people have responded positively to my disability. I have always been a confident person, which I believe has really helped when meeting new people, as my disability is only a very small part of who I am and does not define me. Unfortunately there will always be some people who make inappropriate comments, however these people aren’t perfect themselves and are different in their own way. Changing the topic or putting the focus back on them usually helps to address any inappropriate or negative remarks,” shared Ben. At the age of 16, after attending the family solicitor with his family, Ben realised that he wanted to be a lawyer. Ben’s pathway into this field saw him combine both full-time work with tertiary studies and relocate from the country to Sydney to pursue these opportunities. “Once I finished school I commenced working in a law firm in Sydney. For almost ten years I worked as a paralegal whilst I completed a Bachelor of Business and Bachelor of Laws at the University of Technology Sydney. Since being admitted as a lawyer in 2007, I have specialised in planning, environmental, and local government law,” said Ben. Ben’s studies and professional work have assisted him in developing new abilities and ways of overcoming any challenges that present. “I taught myself to type through university, and whilst I type with two fingers and my elbow, I am quite quick!” laughed Ben. When there is a lot of typing Ben’s “wonderful secretary” assists him by typing his dictations. Ben acknowledges that his limb difference has limited him from pursuing some goals, but in other ways it has opened up new opportunities. “You know, I thought that I might like to learn to fly a helicopter and when I was young I was interested in becoming a doctor but I didn’t feel these suited my abilities so have chosen a legal career path that both suits my abilities and is something I really enjoy,” said Ben. Equally, Ben was quick to say that “I’m sure it wouldn’t be impossible to fly a helicopter or become a doctor and one day I might end up giving these a go too”. Sport featured prominently in Ben’s childhood and while he thought he couldn’t pursue some of these sports competitively when young he is now doing just the opposite. More than that, Ben is actually now an Australian Champion para-cyclist. “I used to ride a mountain bike as a child with my brother who also raced road bikes, but because of my disability I couldn’t handle the mechanical gearing on a road bike or the brakes. Although I always wanted to race road bikes, I instead played competitive tennis for 10 years throughout my schooling years,” explained Ben. In recent years, however, the opportunity to pursue the goal of competitive road cycling has emerged for Ben. “About two years ago I attended a Talent Search Day with the Australian Paralympic Committee (APC) and was told that only wheelchair tennis was offered at the Paralympics however I had the physical attributes to compete in cycling. Shortly after the Talent Search Day I met Paralympian Pete Brooks from the APC on a ‘Try the Track Day’ at Dunc Gray Velodrome in Sydney who helped me with my training and modifications to my road bike. Since then I’ve been racing with the Hunter District Cycling Club and training with the Hunter Academy of Sport and my track coach Glenn Lewis,” explained Ben. In a short period of competitive track and road cycling Ben has shown himself to be an outstanding competitor. During the last year alone, Ben has won numerous cycling medals. At the 2015 National Para-cycling Track Championships (C4), Ben won the Gold Medal in the 4km Pursuit and the Silver Medal in the 1km Individual Time Trial. 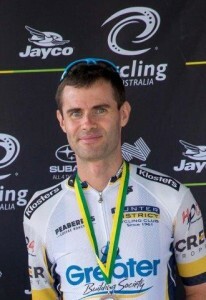 At the 2015 Union Cycliste Internationale (UCI) Para-Cycling (C1) Road Event, Ben won Bronze Medals in the 24km Time Trial and 72km road race. At the 2015 National Para-cycling Road Championships (C4), Ben set a new Personal Best in the Time Trial with 38.1km per hour average over 24km taking out the Bronze Medal, and also won the Silver Medal in the 72km road race. With a raft of Australian medals under his belt, Ben said that he is “now training for the track season at the end of the year with the goal of competing overseas, such as a World Cup or World Championships”. Ultimately, Ben hopes to make it to a Paralympics and has his “eye on making it to Japan in 2020”. Ben is passionate about para-cycling as “it’s an awesome sport with various classifications for different disabilities. It’s also extremely competitive world-wide with pro-cycling teams now sponsoring para-cyclists”, explained Ben. Having had a limb difference for 36 years, Ben has witnessed significant positive changes in the community, social and sporting support available to children with disabilities and families over that time. “Even sporting bodies such as the Australian Paralympic Committee provide services that weren’t offered when I was a child. I’d strongly recommend getting children involved in Paralympic sports, which can provide a sporting network of friends with similar experiences and disabilities”, Ben advocated. Ben is pleased that the Limbs 4 Kids program has now been established and hopes that it, and his own story, can assist children and young people with limb differences to pursue their goals in life. “While limb difference can present some challenges, it is important to remember that is only a small part of who you are. Having a limb difference can also make you more aware of your natural abilities and open up opportunities that you may not have had otherwise,” enthused Ben. Limbs 4 Life would like to thank Ben for taking the time to share his story and wishes him all the best with his professional and sporting careers. Indeed, we all hope to see Ben as a member of the Australian Paralympic team in 2020!